Are clocks the only way to mark time? Alternatives could hold important messages for you! 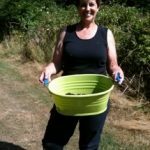 As I write this blog post, I am munching on freshly picked Hornby Island blackberries, gently rinsed of dust and spider webs. My legs and arms are scraped (the bleeding has stopped! ), my sneakers and finger-nails are dotted with purple blotches of berry juice, and my clothes are in the laundry! Is there anything more delicious than these hard-earned sweet berries? 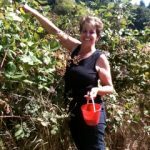 Having grown up in the Pacific Northwest of this continent, blackberry picking is a beloved ritual of my Augusts. I understand that these berries grow wild in many parts of the world; for me, they are my ‘summer clock’. They are the clearest indicator of where I am on the summer/time continuum. I had forgotten about this until this past weekend, when I spent a wonderful weekend with clients/friends at their cottage on one of the gulf islands off our coast. Time is slower there. 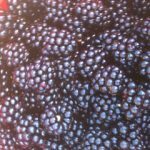 While berry-picking in a beach-side patch, I remembered that berry-time metric of my youth. In the late spring, the wild blackberries are covered with penny-sized white blossoms full of promise of the sweet delight ahead. Then the berries form in the early summer; hard, green little beads. In July they begin to redden and plump. By mid-August, they are ripe; black, fleshy & juicy. It is bitter-sweet that their ripeness also signals the near end of summer. How do you measure your days? In minutes and hours? Numbers of procedures or patients? Dollars earned? In our busy work-a-day lives, we get used to certain metrics that tell us how much we have accomplished, how long we have to work, how close we are to our goals, what we have attained or achieved. Dedication of your staff (How long have they worked for you? Do you acknowledge them for that?). How old is your equipment, what kind of shape is it in? What important lessons have you learned since you began your career? It’s really quite amazing what happens when you slow down enough to spend a few hours on a beautiful, hot August day with friends, picking wild berries with the sun on your face and the ocean breeze at your back. I plan to keep this new awareness of the alternative to thinking always in terms of minutes, dollars and to-do lists. What ways in your life can you find to measure your journey? How will they add meaning and dimension for you?